 Interview: Mike Fillon, writer of "The Real Face of Jesus"
The same science has been used to create artists' depictions of dozens of famous faces, including the father of Alexander the Great and King Midas of Phrygia. This new conceptualization of Jesus is based in large part on the work of Richard Neave, a medical artist retired from the University of Manchester in England. "Using archaeological and anatomical science rather than artistic interpretation makes this the most accurate likeness ever created," Jean Claude Gragard, producer of the BBC documentary "Son of God," told The London Times. Gragard used the same image last year in his series. 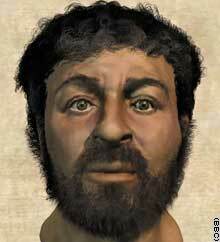 "It isn't the face of Jesus, because we're not working with the skull of Jesus, but it is the departure point for considering what Jesus would have looked like," he added. Neave and a team of researchers started with an Israeli skull dating back to the 1st century. They then used computer programs, clay, simulated skin and their knowledge about the Jewish people of the time to determine the shape of the face, and color of eyes and skin. They turned to the Bible to determine the length of his hair. In the New Testament, "would Paul (one of the apostles) have written, 'If a man has long hair, it is a disgrace to him' if Jesus Christ had had long hair?" the article speculates. The magazine's editors admit that they cannot be certain of the accuracy of this facial representation. "There is no way that we are saying this is the skull of Jesus," Popular Mechanic's Mike Fillon told CNN. "Christians believe ... that Jesus' entire body was resurrected, so there would never be any bones or skull or DNA evidence of Jesus. Plus, his ministry was very, very short. So it would be hard to find a lot of evidence." Instead the article focuses on describing the painstaking effort of imagining the face and how science and theology both played a part in the process. Despite the concerns about accuracy, Alison Galloway, a professor of anthropology at the University of California in Santa Cruz, told Popular Mechanics that: "This is probably a lot closer to the truth than the work of many great masters."